Comes with 2 doors, 4 feeding trays, 4 perches and a metal handle. Removable and sliding bottom tray made of PS material for easy clean. Keep your pet stimulated, safe and happy with an indoor bird cage from PawHut that promotes well-being and longevity for your feathered friends. Finch, parrot, cockatiel, canary, macaw, parakeet and others can benefit from the physical and mental stimulation provided by an enclosure that provides plenty of living space and room for activity. Because you care about your pet and its well-being, we’ve introduced a line of products built with them in mind. Keep them safe, keep them secure, but also keep them active and occupied for a long life worth living. • Perfect for finch, parrot, cockatiel, conure, canary, macaw etc. • Made of metal wire, wooden perches and plastic bottom tray. • 2 doors for easy coming in and going out. 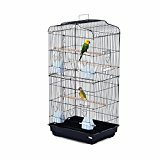 This entry was posted in Birds and tagged 47.5L, Bird, Black, Cage, Large, Macaw, Metal, Parakeet, Parrot, PawHut, Supply by One Boutique. Bookmark the permalink.